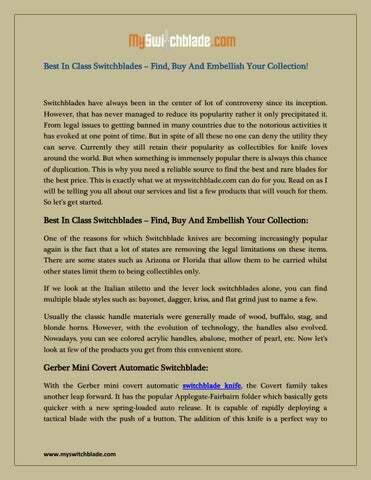 Best In Class Switchblades – Find, Buy And Embellish Your Collection! Switchblades have always been in the center of lot of controversy since its inception. However, that has never managed to reduce its popularity rather it only precipitated it. From legal issues to getting banned in many countries due to the notorious activities it has evoked at one point of time. But in spite of all these no one can deny the utility they can serve. Currently they still retain their popularity as collectibles for knife loves around the world. But when something is immensely popular there is always this chance of duplication. This is why you need a reliable source to find the best and rare blades for the best price. This is exactly what we at myswitchblade.com can do for you. Read on as I will be telling you all about our services and list a few products that will vouch for them. So let’s get started. Best In Class Switchblades – Find, Buy And Embellish Your Collection: One of the reasons for which Switchblade knives are becoming increasingly popular again is the fact that a lot of states are removing the legal limitations on these items. There are some states such as Arizona or Florida that allow them to be carried whilst other states limit them to being collectibles only. If we look at the Italian stiletto and the lever lock switchblades alone, you can find multiple blade styles such as: bayonet, dagger, kriss, and flat grind just to name a few. Usually the classic handle materials were generally made of wood, buffalo, stag, and blonde horns. However, with the evolution of technology, the handles also evolved. Nowadays, you can see colored acrylic handles, abalone, mother of pearl, etc. Now let’s look at few of the products you get from this convenient store. complete a collection, while also owning a perfectly balanced auto-opening knife. Let’s look at the specification below. Overall Open Length: 6.5 "
What Else? So what else would you like to know about switchblades? Here at MySwitchblade.com we carry more than just Italian switchblades but you can get blades from many places around the globe including: Russia, The U.S, Czechoslovakia, as well as Asian imports. We also hold some custom fixed blades and folders from makers like D’ Holder. So what are you waiting for? Just visit our website and place the order for your favorite pieces today before the stock runs out!